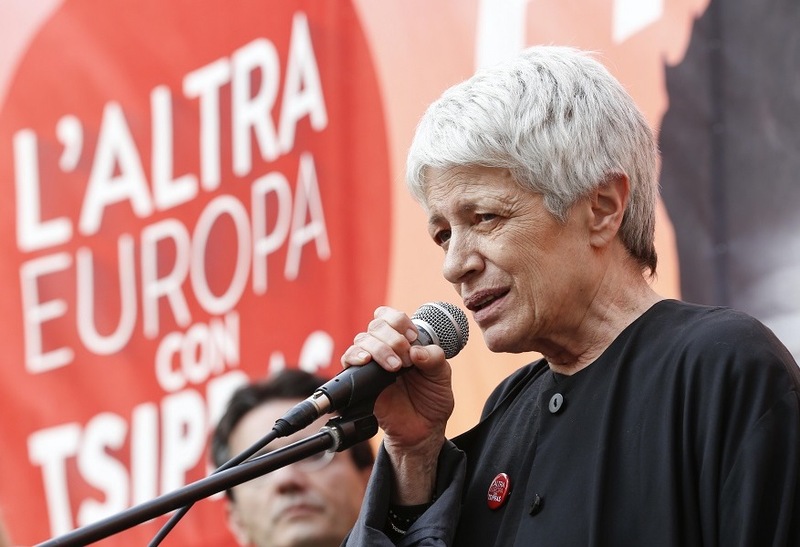 Italian MEP Barbara Spinelli, who recently quit the Tsipras List, the country's radical left front. Last month, nearly a year after the 2014 European elections, the “Tsipras List,” Italy’s radical left front modeled after Syriza, split. The party had registered a respectable 1.1 million votes (giving it three members of the European Parliament), but things soon soured. A founder of the newspaper La Repubblica , Spinelli was in the liberal-green wing of the Tsipras List, whose driving force comes from fragments of the now-dissolved Italian Communist Party (PCI). Many are not sad to see Spinelli go — she promised before the 2014 election not to take a seat in the European Parliament and then did so anyway, and even now after abandoning the front under which she was elected, Spinelli has clung on to her MEP post and €100,000 salary. Setting aside Spinelli’s perceived arrogance, her harsh parting words have struck a nerve by highlighting the failure of the Tsipras List to expand beyond a traditional far-left electorate. This has been the great weakness of the various regroupment projects attempted in Italy in the 1990s and 2000s, and is a clear contrast with the situation in Greece. In some ways this was written into the Tsipras List’s DNA: while the Greek and Italian working classes clearly have common interests in the eurozone crisis, choosing to name a party after a foreign political leader is hardly an encouraging strategy. But Spinelli’s proposals for a wishy-washy center-left force are a strategy doomed to repeat — rather than pose an alternative to — the radical left’s loss of political direction over the last two decades. The tragedy is that fifteen years ago one of the Tsipras List’s main components, Rifondazione Comunista, (the other being Sinistra Ecologia Libertà, SEL, which emerged from a 2008 split in Rifondazione) itself represented the great hope of the European left. It repeatedly won around 2.5 million votes in national and European Union contests and earned admiration as a party with a major presence in the post-Seattle anticapitalist movements. Yet today, despite retaining a 25,000-strong paper membership, Rifondazione has few functioning branches, no newspaper, and little remaining public profile. The collapse of Rifondazione epitomizes the disarray of the Italian radical left and its inability to mobilize the same kind of anti-systemic or antiestablishment sentiment as Syriza in Greece, Podemos in Spain, or even the populist right in Italy itself. The radical left is still reeling from Rifondazione’s disastrous involvement in the center-left governments of the 2000s. Fixated on keeping Silvio Berlusconi out of office, Rifondazione in fact wielded little influence on the coalitions in which it participated, and continually diluted its own politics to the point of voting for the war in Afghanistan in order to keep the social-liberal Romano Prodi in power. The result was the 2008 election, a triumph for Berlusconi and the first national vote since World War II to return not a single communist MP, provoking widespread demoralization on the radical left. Even though Berlusconi first came to power in 1994 amid a crisis of Italian democracy (after the PCI’s self-immolation in 1991 also melted the anticommunist glue that had held together its great Christian Democratic rival), the Italian left today seems unable to dispel the myth that Italy is ruled by a liberal establishment opposed by right-wing populists. Habitually invoking the need to “defend the Constitution” that came out of the antifascist resistance, or protesting that Berlusconi or the Right transgress some mystical “republican ethics,” much of Italy’s once-mighty communist movement seems unable to break with the decades-old rhetorical preoccupations of the PCI, further associating it with Italy’s moribund republican establishment. This political paralysis comes despite the significant rightward shift in both the self-presentation and the government record of Matteo Renzi’s Democratic Party (PD), which today rules Italy in coalition with small centrist and center-right forces. Prime Minister Renzi’s party represents the bulk of the former PCI, together with various liberal and Christian Democratic forces that merged with it in the 1990s and 2000s. For his part, Renzi is an avowed disciple of Tony Blair and has adopted his mentor’s tactic of aggressively confronting his base to prove his leadership credentials. His key measures include the introduction of a liberalizing “Jobs Act” and the abolition of constitutional Article 18, both of which make it harder for trade unions to organize and easier for employers to fire workers. In a sense, the PD leader has gone even further than Blair in his open disdain for his party’s historic “social partners.” In response to his provocations, Susanna Camusso, leader of the five-million-strong CGIL union federation, recently declared that she would no longer vote for his party. Indeed, Renzi’s party has maintained a stronger electoral position than European social democracy in general, at least in the sense that Berlusconi’s antics have divided the traditional right into so many fragments that the Democrats enjoy a huge lead even with only 35 percent support. Prime Minister Renzi has now tried to consolidate this advantage by introducing a new voting law. It proposes a new undemocratic system that gives a large parliamentary majority to the first-placed party, even if it scores well under half the vote. The planned changes will make it harder for small parties to achieve any sort of parliamentary representation, posing further obstacles to the radical left getting off the ground again electorally. There are some signs of hope. One particularly significant recent development has been opposition to Renzi’s “Good School” reform, with much media attention devoted to striking teachers marching in Rome who declared “we won’t vote PD anymore.” Among other things, the bill just passed in the lower house imposes unpaid internships on high school students, targeting poor and working-class students in particular. While (relatively more middle-class) liceo pupils have to work two hundred hours, their poorer counterparts in technical and professional schools have to put in at least four hundred hours. The movement to reverse the legislation has been one of the most important struggles in recent years, not least because it is a movement to defend education itself, rather than merely a sectional teachers’ dispute. The resistance has united both “official” and base unions and has been supported by large mobilizations of students and parents. With its use of both officially sanctioned and wildcat strikes, and its demonstrations and occupations, this fightback has also encouraged the partisans of a “social strike” — a popular autonomist slogan that imagines a movement extending beyond the workplace to rally the precarious, the unemployed, and service users more widely. A further (though nascent) initiative to bring the trade union movement beyond the factory gates is the “social coalition” set up by Maurizio Landini, leader of the 350,000-strong FIOM metalworkers’ union. Landini has described his new movement as “a means of political participation outside of parties,” with its rallies so far addressing the themes of opposing austerity, defending migrants, and opposing criminal control of business. While Camusso slapped down Landini for his “improper wielding of the union for political ends,” in fact the FIOM leader has so far given little precise definition of his strategy. Despite these positive developments, the most striking feature of Italian political life today is that the support lost by both centrist social-democratic parties like PD and the forces previously grouped around Berlusconi is, for the most part, feeding into the reinvigoration of the populist right. This is clearly visible in the resurgence of Lega Nord, a right-wing party that once campaigned for the independence of Northern Italy and habitually derides everyone south of Florence with racialized accusations of laziness and corruption. While Lega Nord’s support slumped to around 5 percent a few years ago, the party now regularly polls around 15 percent and enjoys strong support even in the historic PCI heartlands of industrial Turin, Milan, and Genoa. Recently, Lega Nord set up a Southern party, designed to whip up Roman and Sicilian animosity toward Albanians and the marocchini (or “Moroccans,” a pejorative term for immigrants from a region extending from West Africa to the Middle East, and all the way to the Indian subcontinent). A February rally in Rome even received video greetings from Marine Le Pen, leader of France’s far-right National Front. This channeling of antiestablishment sentiment into right-wing populism is also, in part, expressed in the strength of the Five Star Movement (M5S), which though extremely eclectic in its ideological makeup, increasingly coheres around its leader Beppe Grillo’s anti-migrant, anti-EU, anti-trade union politics. Though organizationally chaotic — expelling no fewer than 34 of its 168 MPs and senators in less than two years — M5S is the second leading party in the Italy today, regularly polling above 20 percent. Grillo has called for the “wiping out” of trade unions and protested the introduction of citizenship for the children of migrants born in Italy. However, M5S does not have a classic right-wing or conservative voter base, enjoying particularly strong support from the young and unemployed. Its success is owed to its devoted efforts to expose establishment corruption, which have strongly appealed to Italians unable to exploit the patronage networks and favoritism so prevalent in the traditional parties. The low level of trade union struggles and the increasing absence of “class” from left politics have opened the way for what is ultimately a hopeless illusion — the idea that somehow getting rid of la casta, or the establishment, (which in the mouth of Beppe Grillo includes the big trade unions) will provide a magic bullet for Italy’s many problems. These include terrible infrastructure, low productivity growth, and a demographic crisis in which a declining active population pays for an ever-greater mass of pensioners, all while close to half of young people are forced to choose between unemployment or emigration. With mass youth unemployment, the retreat of public services, and the old PCI voter base dying out, there is no obvious path for the radical left to advance through a split in the PD or the unions. If in the 1990s and 2000s Rifondazione’s fixation on Berlusconi led it to partner with a governmental “left” dominated by the architects of Italian neoliberalism, the central challenge of today’s communists is to outcompete the populist right as an antiestablishment alternative. In this sense, one fortunate consequence of Renzi’s Blairite coup in the Democratic Party is that it has poured cold water on recent efforts (most notably in the form of SEL, in the run-up to the 2013 election) to create a ginger group allied to the PD that forms part of a nominally center-left establishment. However, in the May 31 regional elections SEL supported a number of PD candidates, in some cases favoring that party to candidates running under the Tsipras List and similar banners. The Italian Constitution states that Italy is a “democratic republic founded on labor,” and trade union officials seem never to tire of reciting this incantation. But beyond the fact that Italian capitalism has indeed been built through low paid, backbreaking toil and the processing of human life into capital, this romantic line has always been a fiction. And two decades after the demise of the parties who wrote such words, this document is a dead letter. The radical left’s age-old rearguard defense of “republican ethics” or “the Constitution” has little to say to today’s dispossessed and marginalized, those without a stable place in society or even the hope of one. Pious laments for the past, or attempts to regroup the votes of old PCI supporters, are a guaranteed route to political death. Hope always dies last, and the future is yet to be built, but the radical left in Italy (and elsewhere) cannot simply copy the Greek example. Syriza’s success, despite its precarious position, is rooted in patient activism that began before the fall of the colonels’ regime in 1974, and continued through the heyday of Greek social democracy in the 1980s and ’90s, culminating in its exploitation of the Pasok crisis of the last five years. In Italy, conversely, this whole period has been characterized by the slow-motion car crash of the radical left, increasingly reduced to a kind of “people of the Left” subculture that lacks a clear positive vision of Italy’s future. In this sense, neither reviving the PCI tradition nor imitating Syriza can provide an answer to its crisis. If there is to be an “Italian Syriza,” it must start by giving a voice to the disenfranchised and the hopeless, frankly assessing the failures of the last decade, and clearly breaking from any kind of identification with a “family of the Left” based on rose-tinted republican traditions.